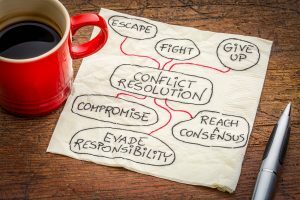 Did you know you have a conflict style? We all have a default approach we go to when faced with conflict. Recognizing our own conflict style (and other people’s conflict styles) can help us approach conflict more constructively. Avoidance: As the label states, people who avoid conflict tend to ignore the issues rather than engage in the dispute. These people ignore their own needs, and the needs of the other, perhaps because they cannot imagine there is any way to reach resolution. Conflict is often left unresolved or is resolved by someone else. Accommodation: With this approach, a person will place the other person’s needs and interests before their own. They will sacrifice their own goals to appease the other person. They may feel it is better to ‘give in’ rather than engage in conflict, as a way of having peace. Competitive: With a competitive approach, conflict is perceived as a win-lose situation. A person’s desire to prove that they are right or win an argument is paramount. They emphasize their own needs and disregard the needs of the other person. Compromise: People who tend to compromise give some weight to their own needs and some weight to the other’s needs. This approach is often thought to be the most fair, and it can lead to a good enough solution. But it also can feel not fully satisfying to either party; and leaves the opportunity for a better solution on the table. Collaboration: People who collaborate place a high concern on their own needs and on the other person’s needs. They seek to find a solution that meets both parties’ needs and interests. Rather than just compromising (which can often feel like settling), the parties work together to develop creative options that allow each party to feel as though their needs and wants are being met. In my experience it is helpful to be mindful of your own conflict style. Most people fall into one of the first 4 styles. Having an awareness of your own style can allow you to make a conscious effort to move in the direction of collaboration. For example, if you are an accommodator, you know that you tend to put the needs of other person ahead of your own. You can then make an effort to focus more on your own needs without losing sight of the other person’s needs. If you are a competitor, you know are already good at focusing on your own needs, so you can try to be more aware of the other person’s needs. Learning about these conflict styles was eye-opening for me, and it has proved invaluable in helping me guide people to try a more collaborative approach to conflict resolution, to open the door to more creative solutions that satisfy both parties’ needs.